Most of us go through the times when we require a sudden need for various conversions. Then we search across the Google and variety of different internet sources to attempt the conversions. In order to perform the conversions with ease and reliability, we're hence writing an article about the best free Word to PDF converters that do not only allow you to do the conversion from Word to PDF but also in JPEG, PNG, BMP, TIF etc. Recommended Looking for a perfect Word to PDF convertor? Here is one great tool that can really help. Word to PDF convertor is a Chrome extension that allows you to converts your word documents to PDF. The extension basically allows you to get your Word docs converted to PDF file format instantly from your home and new tab page. The conversion is done on a website instead of having to install software. So it means you can save time as well as effort since you don’t have to install any software. While most PDF making files would require further installations to be made in your operating system, this one wouldn't. 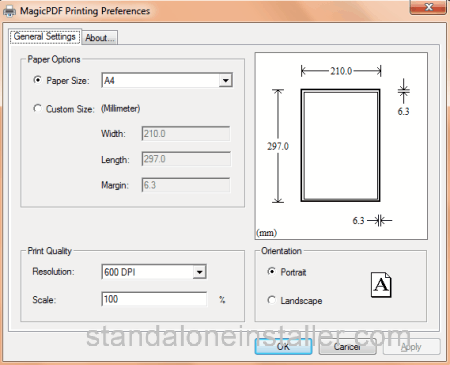 7-PDF make is standalone software and doesn't require you to install any additional settings and any PDF printer. Download this converter simply, install it and attempt your desired operation. The application composes a basic interface and no complexity at all. Simply add in the document that you want to convert, change the settings and accept the proposal of preceding the conversion. 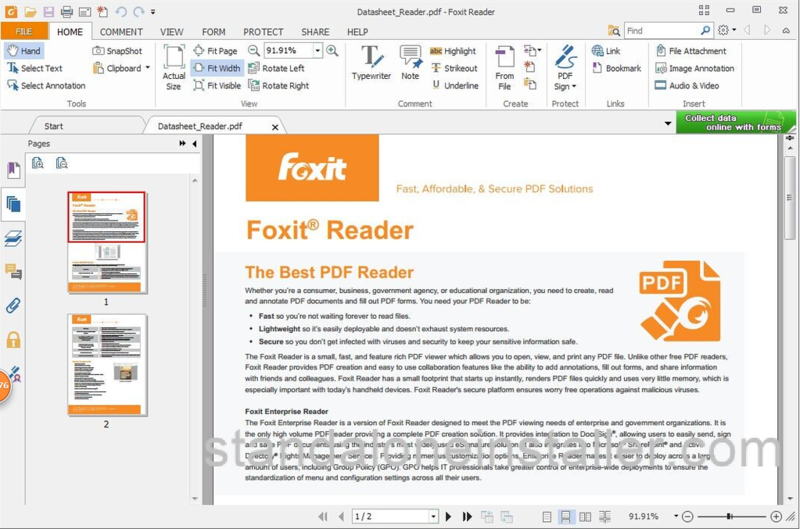 The Foxit Reader is also one of the useful apps that help in delivering the required conversions. However, it sort of follows different criteria in doing the conversions as compared to the above mentioned app. 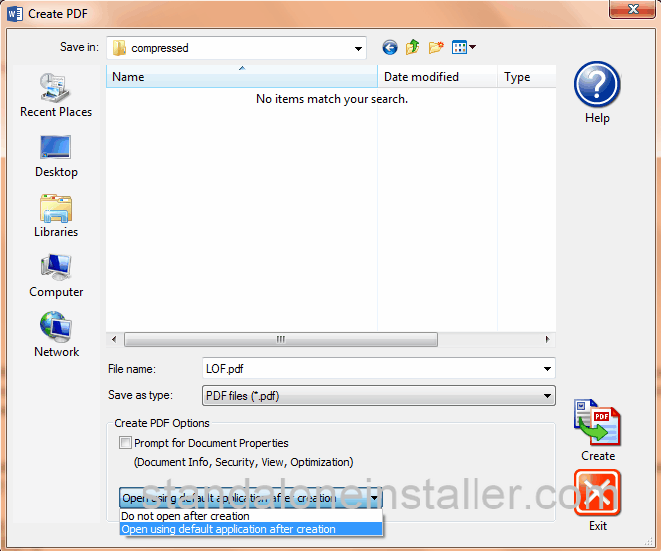 While you attempt the conversion through this software app, you require to add some additional PDF plug-in. Furthermore, the PDF printer is also needed to be installed. The app also allows conversions from Word to DOCX file. The app allows you to perform the conversion from Word Document to PDF. When you download the app, a virtual printer installs itself into the PC. Additionally it also allows you to add distinctive parameters in your conversions i.e. quality etc. After the conversion gets done, simply click the Save as PDF button in order to save your file in the location that you desire to fill. It composes a command menu where you're required to write commands to perform your conversion. 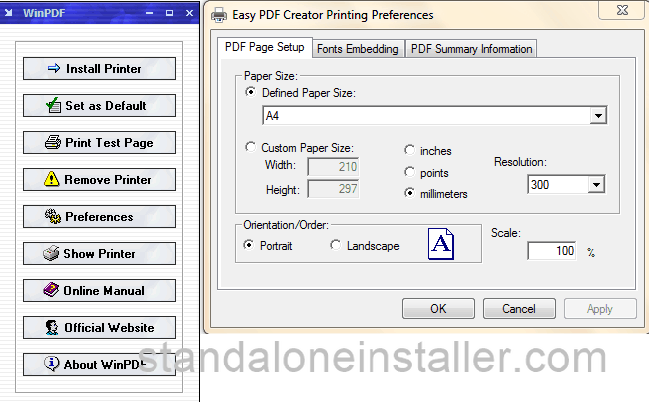 It also installs a menu PDF printer that allows the conversion to take place. You can also manage and set the quality of your output PDF conversion. Furthermore, the app also holds a variety of predefined sizes of the output PDF file. This PDF conversion program allows you to create PDFs from distinctive types of documents i.e. Doc and DOCX files. The virtual printer is required to be installed with the program and then when the conversions would about to take place, you'd be needing to add that printer into this program. You can also set quality settings for your output PDF documents. The parameters for quality settings are eBook, Medium Quality, and High Quality. You can also add passwords to your PDF files after the conversion is done. With this program you can add up the Meta info into your PDF files like Title, Subject, Keywords, Author and also Producer. While you scope to perform the conversion through it, you require installing a virtual printer in the PC and also, a command menu where you write the commands to precede the operation of conversion from Word Document to PDF. Additionally, it holds various security options in its Encryption menu. Through this app you perform the conversion from Word Documents to PDF format by a simple printing command. The app's interface is quite basic and doesn't add any complexity in the users' mind. Despite of containing a basic interface, it yet possesses all the features to deliver the required PDF file in the good quality result. Install the program in the computer and start implementing to attain the required output. Simply open up the program, and add in the print command as you do it usually. 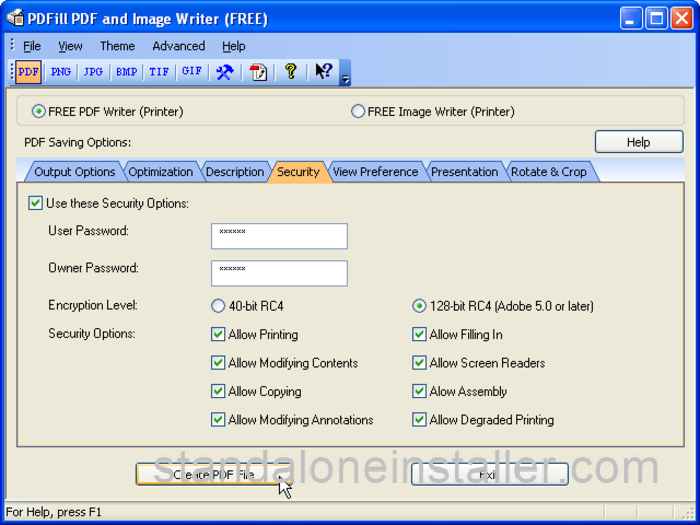 Now when you're done doing that - select PDFill Free PDF & Image Writer. Then click the button, "Print"! And save your file in whatever the location you want to save it in. Additionally it also outputs the document in the form of JPG, JPEG, BMP and PNG formats. 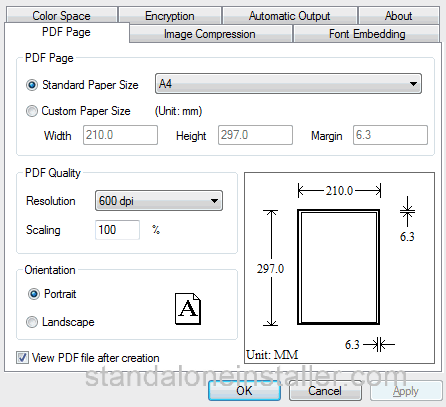 Solid PDF Creator also does the operation of converting your document into PDF format. It enables you to create PDF from any of the printable documents i.e. DOC and DOCX files. Furthermore, when you're done with the conversion - it gives you an option that if you want to open or not to open the output PDF. One of the benefits of this program is that it takes a very small space i.e. 1.1 MB. It is easy and possesses a very nicely designed interface. In order to implement the conversion, you simply deliver a print command and select the Bolt PDF as your printer from the given list. It allows the conversion from DOC to PDF & DOCX to PDF! You can also add some of your desired settings in the PDF output. The font embedding, PDF summary etc can be made easily. The program acquires a very small space i.e. 1 MB and is a lot flexible for many reasons. 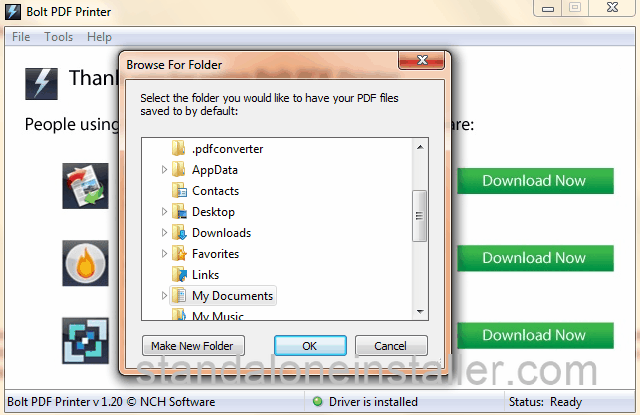 Choose the CuterPDF Writer from the list of all the installed programs. When the conversion is done, the menu would appear at which you'd be required to set the destination of that output PDF. The program, as it sounds is impressively cute and sure does display a basic and simple designed interface for the conversion. Through this app you can perform the conversions to PDF format from variety of formats. In order to implement the conversion, you'd need to first install the application. After when the installation gets done, deliver a print command with the help of your File Menu and select the 7-PDF Printer from printers' list. Then click the print button and save the PDF file in the desired location. The program enables to perform the conversion from even your Word Documents and also the other Office documents' file. 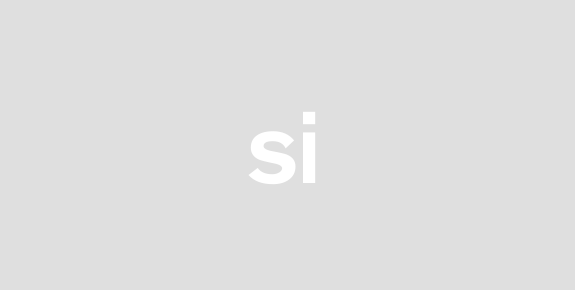 Install the program, then deliver the print command - explore for the Z-ViPrinter from the list of printers and precede the conversion. Then, set the location after the conversion is done and save it there. You can also set DPI, Paper Size, Separate PDF for your converted pages! The free virtual printer forms PDF files from various other printable files or documents. However, one of the things to notice about this program is that it only enables the conversion to be done in the size of A4 - if you're running the app in free version. The size of program is quite small i.e. 923 KB and it also composes a very easy criteria for the installation. When the installation is done, simply choose the MagicPDF from list of printers, deliver the print command and attempt the conversion. 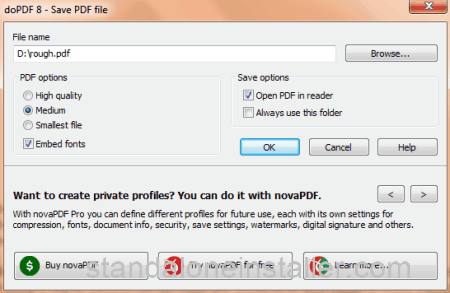 When done, simply type in the name of the converted PDF and save it to its destination. Like other converters, this one too is one of the top 17 programs that add in a lot of ease for you when you're scoping to attempt conversions. You could freely explore all of its features by just simply downloading it and implementing the operations. 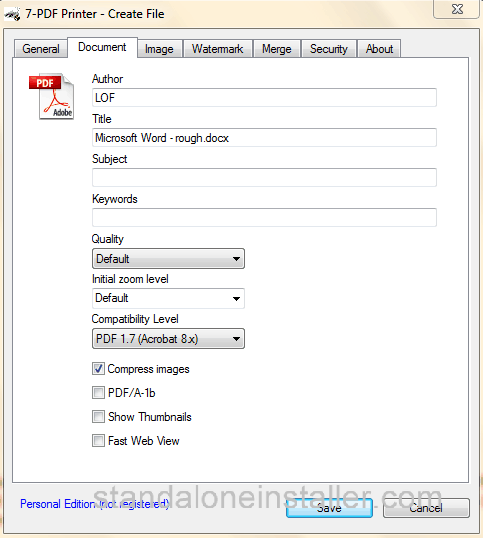 Open up the menu of Word Document, and select the Some PDF Creator printer from the printers' list. Then proceed to the further operations and approve the printing option. After the conversion is done, simply save the output PDF. 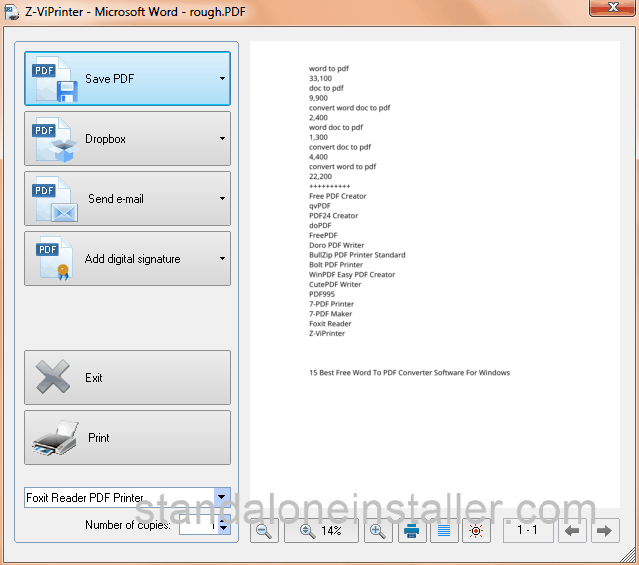 If you know more about such software, feel free to add in the list of best free word to pdf converter software. For latest updates, stay locked to us.